No this not one of those mysterious sightings of shadow people that have become a hot topic of conversion in paranormal chat rooms, message boards and websites. 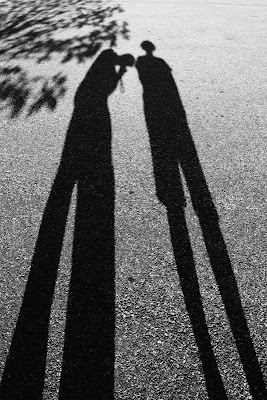 It's just our shadows in the late evening sun on parking lot asphalt. Thanks to Cindy for idea! Canon G10, 1/125 of second at f/5.6, ISO 100, 32mm equivalent focal length post processed into B&W using Photoshop Elements and the Silver Efex Pro plug-in.